The striking Audi Q5 blends the proven performance of a sedan with the exceptional versatility of an SUV, helping it earn its proven reputation as a leader of the luxury crossover SUV segment. Capturing the attention of onlookers, unique design elements found on the exterior of the Q5 include a widened SingleframeⓇ grille, distinctive Tornado design lines, and available 3D LED headlights. Ingenious technology features offered on the Q5 include the Audi virtual cockpit with a 12.3-inch instrument cluster and MMIⓇ touch with handwriting recognition. Thanks to a generous 53.1 cubic feet of cargo capacity with the standard split-folding rear seats lowered, driving an Audi Q5 means that you'll never have to leave that extra suitcase behind when packing for a weekend getaway. Standard power comes from a 2.0L TFSIⓇ engine and quattroⓇ all-wheel drive, providing you with a perfected combination of power and efficiency. Regardless of where your travels take you, Audi pre sense® basic and Audi pre sense® city each add additional confidence in all driving situations. Featuring a full suite of available driver assistance systems, class-exclusive tech, and inspired performance -- it's no surprise that drivers continue to choose the Audi Q5. Returning for the 2019 model year, the Audi Q5 gets a few adjustments and updates. New standard equipment found on every Q5 include electric rear child door locks, heated front seats, and a 7-inch color driver display. On Premium Plus trims, rear USB ports and MMI® Navigation are now standard features. Making its debut this year, an optional Black optics package lets you equip your Q5 with Matte Black roof rails, Titanium Black exterior trim, and Audi Sport® 20-inch 5-arm off-road design Matte Titanium finish wheels. Every Audi Q5 comes equipped with a standard 2.0-liter turbocharged TFSI® engine which delivers a balanced 248 horsepower and 273 lb-ft of torque. This impressive powertrain can accelerate from 0 to 60 MPH in just 5.9 seconds which can help invigorate your daily drive. Legendary quattroⓇ all-wheel drive with ultraⓇ technology maximizes performance and efficiency by powering the front wheels as often as possible while still retaining the ability to direct power and grip to the tires which need it most. A total of five driver-selectable modes in Audi drive select adjust the steering, transmission shifts, and throttle response of your Q5 to tailor your drive to suit your desires. 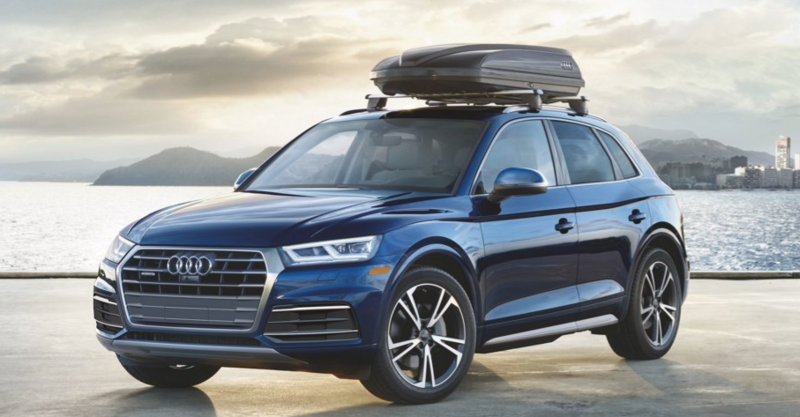 Giving you the ability to bring even your biggest toys along for the adventure, the Audi Q5 has the capability to tow up to 4,400 pounds when equipped with an optional trailer hitch. Inside the premium interior of the Audi Q5, you'll discover an array of innovative technology features which help improve your commute. Choose the optional Audi virtual cockpit to enjoy a fully-digital 12.3-inch instrument cluster which allows you to personalize information including phone, audio, navigation, and Google Street View™ or Google Earth™ screen options. Available MMIⓇ touch with handwriting-recognition technology simplifies how you navigate maps by allowing the driver to "write" their desired entry as opposed to fumbling around with buttons. Enjoy unrivaled comfort from standard heated eight-way power front seats featuring seat memory and four-way power lumbar adjustments for the driver. A massive 53.1 cubic feet of cargo capacity comes from lowering the standard split folding 40/20/40 rear seatbacks. Featuring adjustable recline in the second row, your Q5 is able to carry a mix of passengers and cargo on your way to your next ski trip. Few luxury SUVs prioritize the safety of you and your passengers quite like the Audi Q5. The Audi suite of advanced driver assistance technologies acts as an additional set of eyes to keep you protected from the unexpected. Standard Audi pre senseⓇ city can detect stationary vehicles and pedestrians at speeds of up to 52 MPH, prepare you for an imminent collision, and initiate emergency braking. Using radar sensors and optical warnings, Rear cross traffic assist can alert you to approaching vehicles and suggest to stop the vehicle. Included on Prestige trim levels, Audi park steering assist is able to measure gaps and automatically steer into them. In an effort to warn you and the front passenger of vehicles or cyclists approaching from behind, Vehicle exit assist will warn you before you open the front doors. These technologies are able to prepare you for an imminent collision by partially closing the sunroof and side windows along with pretensioning the front safety belts.